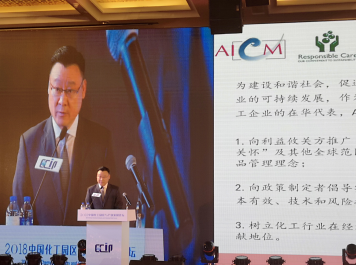 On May 24th, AICM Hosted the CEO Forum in “2018 China Chemical Industry Park and Industry Forum” in Zhuhai, themed ‘International Chemical Companies ‘Development Road in the New Era. The conference discussed the sustainable development of chemical industry parks, Win-win on Sustainability Development and Profit Growth, Ideal investment destinations for multinational chemical companies under new situation. 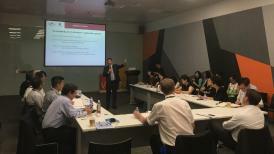 Business leaders from nearly 20 multinational chemical companies in China and Zhang Yuzhong, deputy director of the Investment Promotion Bureau of the Ministry of Commerce, as well as leaders and experts from Zhuhai Economic and Technological Development Zone, China Petrochemical Federation, and the European Chemical Park Consulting Company also participated in the discussion. All AICM member companies agreed that sustainable development is an integral part of green chemical parks development. Each company should be designed based on its business efficiency strategy. Invest "sustainable" can bring long-term benefits, through better energy and resource management, maximizing operational efficiency to reduce costs. For example, how to strengthen the implementation of new environmental standards to promote the transformation and upgrading of the park and profit-driven, how to combine the "Responsible Care" (RC) practice and environmental, health, safety, security (EHSS) implementation to establish a sustainable development of chemical parks to achieve with chemical business win-win and so on. Sustainable development companies can redefine the corporate ecosystem by designing models that create value for all stakeholders, including employees, communities (chemical parks), shareholders, supply chains, and civil society. Investment sustainable development is not only a kind of risk management, but also can promote innovation. Redesigning products to meet environmental standards or social needs has promoted new business opportunities, resulting in growth profitability and sustainable win-win. Over 1000 participants from the chemical industry participated the event.